Safes in the Resident Evil 2 Remake are mini-puzzles that you have to solve. Basically, to unlock the safes, you have to find the code somewhere in the Police Station. This can be annoying and difficult, especially while you’re dodging bloodthirsty monsters. However, opening the safes is pretty important to your survival; you don’t want to leave anything behind. Then, there’s the Resident Evil 2 portable safes, which are an issue all on their own. So, we’ve put together our Resident Evil 2 Remake Safe Unlock Puzzle Solutions to help you open the safes without having to look for the codes, as well as where to find the safes themselves. If you’re looking for the solutions for the padlocks, head on over to our Resident Evil 2 Remake dial lock combinations guide. 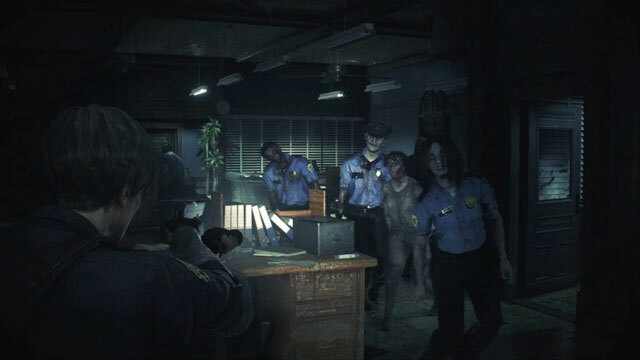 How to Open West Office Safe in Resident Evil 2 Remake? To open the West Office Safe in the remake of Resident Evil 2, you’ll have to input the following code: 9 Left, 15 Right, 7 Left. The actual combination is in the S.T.A.R.S. office on the second floor of the station. The West Office, incidentally, is on the first floor of the Police Station, left of the Main Hall. You’ll get a weapon upgrade for your troubles. It doesn’t sound like much, but it could mean the difference between life and death. This goes for anything that you can collect; this game doesn’t screw around. Police Station Waiting Room Safe – How to Unlock? To unlock the safe in the Waiting Room, you have to find the code. Said code is on the first floor, in the Observation Room, inside a table in one of the RPD documents. Or, you know, here’s the code: 6 Left, 2 Right, 11 Left. The reward you get will be yet another weapon upgrade, which might differ depending on which character you’re playing as, Leon or Claire. Resident Evil 2 Portable Safes – How to Unlock & Where to Find? To unlock the portable safes, you’ll have to commit the combination that the game gives you to memory. The goal is to make the lights turn on in a circle. Unfortunately, the codes are random, so we can’t help you by providing you with a combination. You’ll have to watch what the game tells you, and repeat the combination it shows. As for the locations, there are two portable safes that you can find. One of them is in the Shower Room, which is on the second floor of the police station, in the northwest corner of the map. The other one is also on the second floor, but in the southwest corner, in the Linen Room. It’s next to the Lounge and S.T.A.R.S. Office. It does require the diamond key to open, which is in the Morgue, but you’ll get there by following the story. If you need further help with the remake of Resident Evil 2 remake, check out our other guides, including Lion, Unicorn, Maiden, Goddess Puzzle Solutions and Chess Plug Puzzle – Queen, King, Rook.